$145+ For mature skin types. After receiving an in-depth skin analysis, you will experience a personalized facial including an anti-aging massage. Your skin will be lifted with the anti-wrinkle eye pad treatment and age-fighting collagen mask. For all skin types. 4 treatments in 1 – Diamond Microdermabrasion, Hot and Cold Treatments, Ultrasonic and Galvanic. Cleanse, massage, and tighten your skin, erase spots and blemishes and unclog pores to give your skin an overall treat. For normal or mature skin types. AHA peels involve applying an alpha hydroxyl solution to remove the damaged outer layer of the skin. The peel will reveal a younger, clearer, and more radiant complexion. Minimal downtime required. For all skin types. Flawless skin starts here. After an in-depth skin analysis, you will experience a personalized facial. Your skin is left feeling hydrated, balanced, and refreshed. For normal, oily, or mature skin types. Provides a non-surgical skin refinish procedure, by using sterile diamond heads to abrade or rub off the top skin layer then vacuuming out the particles along with any dirt and dead skin build up. For problem skin. A chemical peel will smooth skin, reduce oil, and lower the number of cystic acne nodules. The service targets ingrown hairs and breakouts. Congested skin will be alleviated, and with a series of treatments, there will be a reduction of acne scarring. Minimal downtime required. For normal, oily, or mature skin types. This two-step procedure is one of the most advanced facial applications in skin care. The AFA Clay Mask draws impurities from the skin and prepares the skin for application. No downtime required. Using Dermal Rollers, skin imperfections are combatted and collagen growth is stimulated. The skin’s surface is left revitalized. Similar results to laser, chemical peels, and microdermabrasian can be achieved with less irritation. For normal, oily, or mature skin types. An intensive anti-aging scar reduction treatment for the skin which helps increase collagen production, promote elasticity and smooth fine lines. No downtime required. $130+ For normal, dry, or sensitive skin types. AFA Antioxidant Peels have been developed in a series of strengths: 20, 30, 40, 50, and 60. This treatment helps exfoliate dead skin cells, as well as remove excess oils, and other impurities from the skin with less irritation than most other AHAs or glycolic peels. No downtime required. Includes a sugar scrub, massage, cuticle maintenance, paraffin, a take home EC Travel Size Nail Polish and an EC Nail File (to keep for touch ups). $65+ Includes cuticle maintenance and UV Hybrid polish application, which lasts up to 2 weeks. $50+ Includes cuticle maintenance and UV Hybrid polish application which lasts up to 2 weeks. Experience luxury by pampering your hands and your feet with the Signature Manicure and Pedicure package. You will receive sugar scrub, massage, cuticle maintenance, paraffin as well as an EC nail file on both your hands and feet. Upgrade your Manicure or Pedicure with any of these à la carte services. 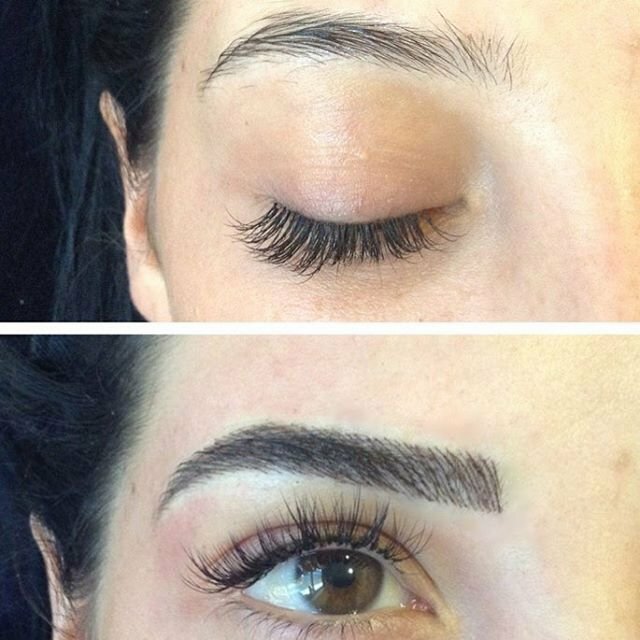 Eyebrow threading defines and creates straight lines while hair is extracted at the follicle level. Our beauty practitioners follow the contours of your unique brow bone in an effort to create the most flattering eyebrow shape customized for you. They follow your natural bone structure while creating your personalized eyebrow shape. Lip threading extracts hair at the follicle level, allowing for slower regrowth in between treatments. Threading is known to be effective, quick, and painless. Microblading 3D Eyebrows – available at ALL of our locations – is a semi-permanent makeup procedure that allows you to dramatically correct or fully reconstruct lost eyebrows. If you’re a busy mom, business woman, or have an active lifestyle, or you just want to look younger, healthier, and more vibrant, you are the perfect candidate for Microblading 3D Eyebrows. Call us to book your complimentary consultation today! This includes the initial appointment and the touch-up appointment. Within a 60-minute appointment, we will create the perfect eyebrow shape – with the most natural appearance – by implementing individual hair-like strokes to the brow line using a plant-based pigment. Microblading 3D Brows is a two-part process: the initial appointment and the touch-up appointment, which must be within 6-8 weeks. The touch-up appointment is required to make any necessary corrections as well as to deposit more pigment into the brow line, creating 3D Brows that will last 8-15 months! The initial touch-up is required 4-6 weeks after the first appointment. A yearly touch-up is recommended as plant-based pigment will fade over time. Semi permanent brows will fade over 8-15 months. Designed to relieve severe tension in the back and neck muscles and the connective tissue or fascia. Pressure and cross-fiber friction is applied in order to release knots. Recommended for individuals who experience consistent pain, are involved in heavy physical activity, and patients who have sustained a physical injury. Specialty massage using smooth, heated stones. The relaxing heat warms up tight muscles allowing your massage therapist to work more deeply and quickly. Relieves strained back and leg muscles in expectant mothers. Especially beneficial in the second and third trimesters, when the extra weight in your belly puts strain on your back. Calms the nervous system, improves blood circulation, and stimulates the body lymphatic system, which carries away waste products. Express neck, shoulder, and upper back massage with specific protocols that relieve tension headaches. Can provide immediate and prolonged relief from headaches. Experience the EC Spa Body & Scrub Wrap to reveal polished and glowing skin. Achieve visible results with the EC Manicure and Pedicure, followed by our Results Driven Facial that is customized exclusively for you. $315 We have combined our most popular treatments for your blissful enjoyment; our Beauty Facial, 60 minute Massage, and an EC Pedicure. Enjoy a full day in the spa with lunch. This package includes our Anti-Aging Facial, 60 minute Massage, EC Manicure, EC Pedicure, Exfoliating Body Scrub & Body Wrap. Finally a more permanent approach to hair removal has arrived. All laser removal pricing is based on a consultation prior to beginning your first treatment. Suitable for both men and women in places where unwanted hair grows. This package begins with a 45 minute massage, followed by a soothing Gentleman’s Facial. The Men’s Retreat Package is completed with an EC Men’s Sports Pedicure. A manicured hand with a strong grip is the perfect way to introduce yourself to new business acquaintances. Enjoy the feeling of being catered to as your nails are shaped and buffed, your hands are exfoliated and your cuticles are removed. The relaxed feeling you will be having at this point will be augmented by a hand massage and the application of warm paraffin wax infused with essential oils. You will leave with a renewed sense of assurance. Your feet deserve a break. Play hard and then indulge your aching feet with an overall exfoliation and polish to remove dead skin. Your feet will be massaged and treated with hot paraffin which improves circulation and makes them soft. Our deep massage helps ease soreness while the hot paraffin treatment softens and moisturizes your feet. Men deserve to be pampered too! Long days can leave you tired and in need of a re-charge. The Gentleman’s Facial is designed with men’s particular skin care needs in mind. Our invigorating and deep cleansing skin conditioning treatment, accompanied with extractions, relieves skin stressed by daily shaving and pollution, improving its vitality and appearance. Cancellations must be completed within 24 hours of your scheduled appointment time. Failure to cancel your appointment or cancellation within 24 hours of your service will result in a $25 charge or you will forfeit your deposit if one was collected at the time of booking. Any further same day cancellations or no-show appointments will result in full payment of the services booked being charged to the guest. Group bookings require 20% deposit and cancellations must be completed within 72 hours of your scheduled appointment times.